Lock in a great price for Quality Hotel Saga – rated 8.7 by recent guests! The room. The hotel location. The menu. The staff. The cleanliness. It was a pleasant experience. Proximal location to everything, meeting point of tour groups, restaurants, grocery, souvenir shops. In the freezing cold, you don’t have to walk very far or at least less risk of sliding in the snow. Breakfast was excellent. Good selection including salmon, herring, afternoon waffles and vitamins (free omega 3). Afternoon waffles are a treat. Rooms are very clean, adequate space and bright wall colors that gives you a bright mood against the gloomy weather outside. Affordable price. It’s not that expensive compared to other hotels. And bonus, beautiful view of the harbor in some rooms. It’s near all important locations, restaurants, shops, tourist stops or meeting points. You don’t have to walk very far in a cold weather. Unlimited breakfast is excellent. Both thumbs up. There were even Norwegian salmon, herring and free vitamins. There are also free waffles in the afternoon. Rooms are clean, with wooden floor. Hotel itself is very clean and painted with bright colors which give you a positive mood in an unstable weather condition. Some rooms have beautiful view of the harbor and mountains. Most of all, it’s not that expensive compared to other hotels. 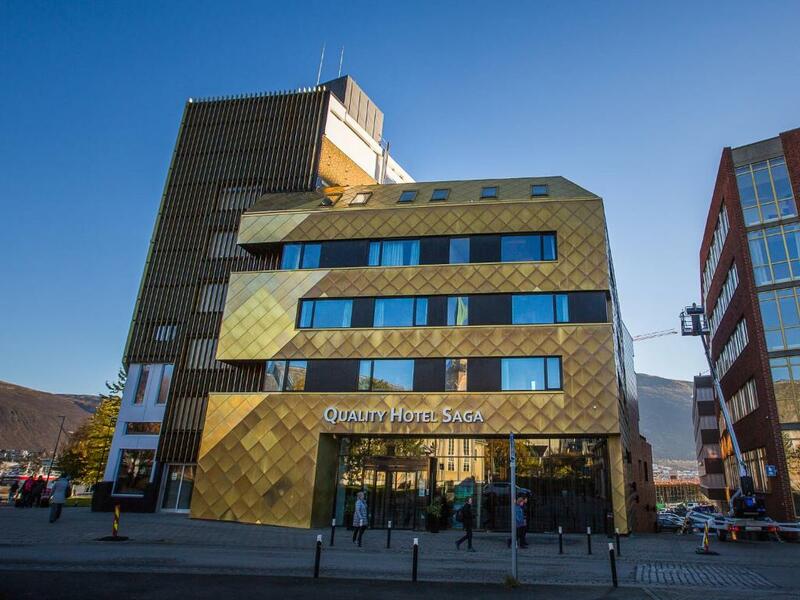 I stayed with a number of hotels in Tromso during my multiple visits in the past 2 years. Room size are considered very spacious compared to other hotels I stayed in Tromso that's for sure. Very helpful staff and comfortable and quiet room. Location, courteous effecient staff, cleanliness, heated bathroom floors, breakfast. Good price, nice room, great location, friendly staff and free waffles in the afternoon! Breakfast was good. Location of the room was facing towards the harbor which was lovely. Quality Hotel Saga This rating is a reflection of how the property compares to the industry standard when it comes to price, facilities and services available. It's based on a self-evaluation by the property. Use this rating to help choose your stay! 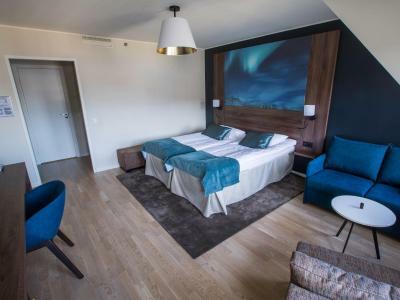 Overlooking the Tromsø Mountains and the city of Tromsø, Quality Hotel Saga offers free Wi-Fi and modern rooms with a seating area and flat-screen satellite TV. Storgata shopping street is 800 feet away. All guest rooms at Quality Saga Hotel have a work desk and tea/coffee-making facilities. Most rooms feature harbor, mountain or cathedral views. Free coffee, tea and waffles are available in the afternoon. The in-house restaurant serves a popular buffet breakfast and a light buffet dinner is available most weekdays. General facilities at Quality Hotel Saga include a luggage storage room, a TV lounge and a guest computer. The airport shuttle stops right outside the door. 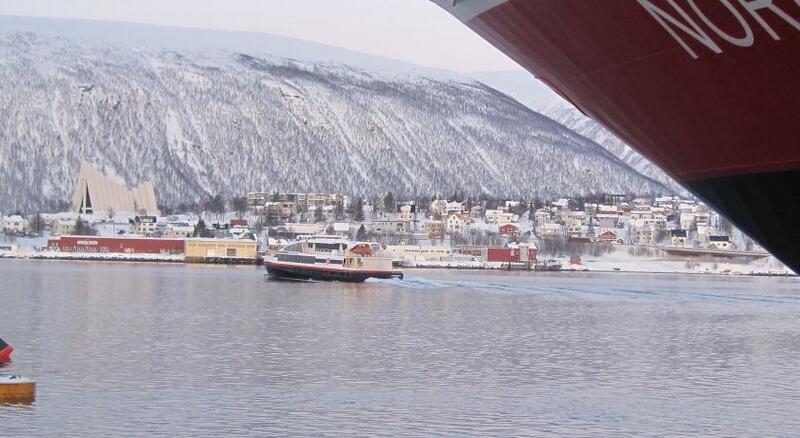 The Tromsø Polar Museum is 1,650 feet away. The Polaria Aquarium is a 10-minute walk from the hotel. When would you like to stay at Quality Hotel Saga? This room includes a flat-screen satellite TV and a sitting area. Private parking is available at a location nearby (reservation is needed) and costs NOK 195 per day. House Rules Quality Hotel Saga takes special requests – add in the next step! Please contact the hotel for more information about evening meal availability. Hotel is good. Staff is very friendly. Hotel has free waffle and coffee in the afternoon. Everyone speaks English very well. It is a good place to stay. There was no ala-carté menu. Room neatly cleaned and maintained. Friendly staff. Good ambience in dining area. Nothing. 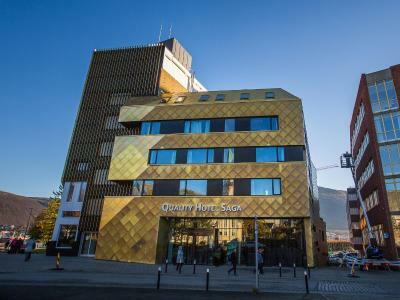 Our group loved our stay in Quality sage hotel the whole time. We kept on talking about it how thankful to be in this hotel. The breakfast was not the best, they had no bacon, and that is a must for me. And the bread was not so good. Also they had pancakes, and thats good, but they where very cold and not flattering. Clean room, and the hotel is in the middel of the city, witch is great. Exiting the garage was a bit difficult due to a tight turn to go up the ramp - suitable for smaller vehicles. Reception staff, especially Knut, were very welcoming, helpful and friendly. Location excellent for exploring the city. Breakfast fabulous with lots of choice. We had a top floor room with a nice view. Tiny, tiny bathroom - for showering not a cubicle but a shower over bath rubber pipe that actually proved to be quite powerful BUT sprayed everything on the only space to put toiletries. Wondered why there was a drainage hole in the middle of the floor. The included breakfast was OK but basic and repetitive, it also got busy if tour groups in. All a bit impersonal, nothing special about it. 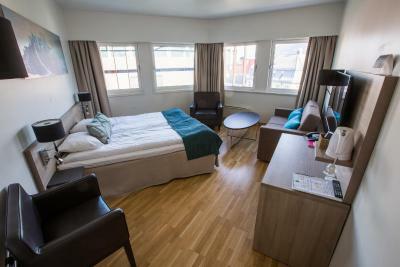 Centrally located in Tromso: good sized room with small entrance hallway leading to small sofa seating area/open plan bedroom. Plenty of space to put cold weather kit. Very comfortable beds and a quiet part of the hotel with big windows overlooking Church square. Everything was just perfect so I don't know where to start with. The bed is very comfortable; shower water pressure strong and hot; room is very quiet. The breakfast buffet is super which is quite important as you would only get a light lunch if signing up with local day tour. In addition, free waffle every afternoon is a plus - so fun and delicious! I have nothing to complain about this hotel, and will come back again next time i visit Tromso. Smiling reception staff. Great location. Nice rooms.